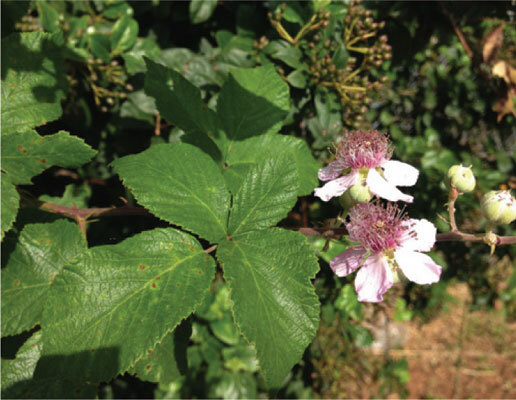 Most Rubus species (family Rosaceae) represent a so far poorly explored source of plant products with a high potential of pharmacological/nutraceutical value (antioxidant, anti-microbial, anti-pyretic, anti-inflammatory, immunostimulant, etc.) due to the content of phenolic compounds and flavonoids. Rubus ulmifolius Schott is a perennial shrub widely distributed at forest borders and uncultivated fields. Leaves and young shoots are used in folk medicine for several interesting properties such as anti-inflammatory, anti-odontalgic, antimicrobial and gastrointestinal spasmolytic properties. Fruits (fresh or derivate products) contribute to a healthy diet for their effects in preventing metabolic syndrome at different levels such as cardiovascular disease and type II diabetes. Here we report an overview of R. ulmifolius and an update of the most recent findings about its phytochemical composition and properties. Standardization of herbal preparations of R. ulmifolius as well as further studies to assess the complex chemical composition of R. ulmifolius bioactive compounds (metabolic profiling) are needed. In the future, novel in vitro approaches (i.e. plant cell, tissue cultures, etc.) together with metabolic engineering approaches might be explored as possible alternatives to cultivated or wild plants for a deeper exploitation of the whole biochemical potential of this plant species. Rubus ulmifolius, antimicrobial, antioxidant, leaf extract, pharmacology, phytochemistry, Rosaceae.